Welcome to Marvel Strike Force Heroes page. This is the full description of MSF Deadpool stats, skills and abilities. Deadpool is a Mercenary Brawler who is extra effective against minions. His first skill strikes for a medium amount of damage and has a high chance for a bonus strike against the same target. It always inflicts critical damage against minions. His second skill deals massive damage and ignores enemy taunt striking the enemy with the lowest Health. Deadpool’s ultimate bounces between the whole enemy team striking all enemies for 230% of his base damage. Deadpool can also remove negative effects from self on the start of each turn and he is granted healing for every removed negative effect. Deadpool was introduced after 1.2 update and he could only be obtained through Deadpool Raid and Deadpool Event. His price is 100 shards, currently obtainable through Mega Orbs, Premium Orbs, and Arena Store. 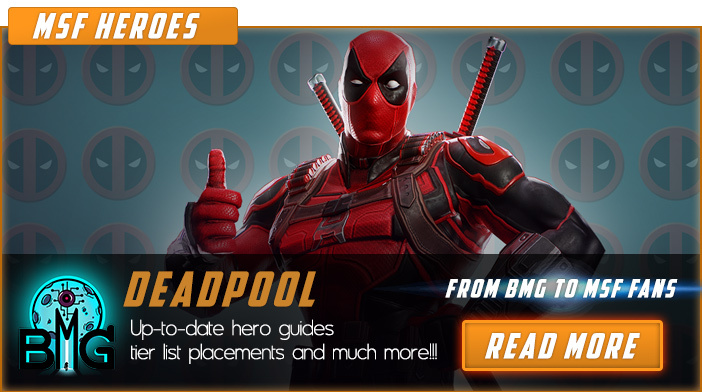 We hope that you enjoyed the description of MSF Hero Deadpool. For detailed information about other MSF Characters check our MSF Heroes page.